Ink cartridge is designed for use with Epson Stylus Color 120, CX5000, CX6000, CX8400, and CX7000F All-in-One Printer. Each cartridge yields 370 pages. 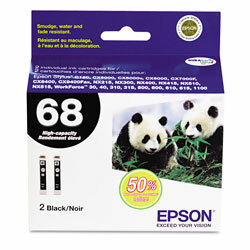 Black Inkjet Printer Cartridges from Epson! 195 In Stock today. I used to buy my Epson ink at either [...] but ReStockIt has them at a much better price. Also, you can purchase what you need rather than everything all in one package. For me, I prefer to use the authentic Epson product rather than other options. Can't go wrong with this duo.